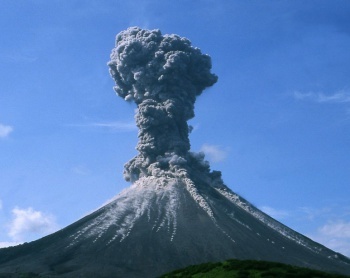 According to a new discovery by volcanologists, the frequency of pre-eruption earthquakes and other seismic activity could provide early warning that a mountain is about to blow its top. Scientists have long known that prior to a volcanic eruption, there is a notable increase in seismic activity in and around the volcano. New research however, has determined that as time passes and the eruption grows more imminent, this seismic activity increases in frequency. It starts as a low rumble, akin to a slow drum beat, then gradually speeds up as tremors build in intensity. This raucous noise continues to grow in speed and intensity until just before the eruption, at which point it becomes completely silent. How do volcanologists explain this subterranean cacophony? Simply put, it's a symptom of increasing pressure. "The frequency of this tremor is unusually high for a volcano," states Alicia Hotovec-Ellis, a doctoral student from the University of Washington who is part of a team studying Alaska's Redoubt volcano. "Because there's less time between each earthquake, there's not enough time to build up enough pressure for a bigger one. After the frequency glides up to a ridiculously high frequency, it pauses and then it explodes," she says. And that "scream" we mentioned in the headline? That wasn't simple poetic license. The research team at Redoubt sped up seismological records from just prior to an eruption to sixty times its normal rate, and at this increased speed scientists report that the noise sounds like a high-pitched scream. Dr Marie Edmonds of the University of Cambridge explains the significance of this finding to the BBC: "This work is probably the most intensive treatment of this phenomenon," she claims. "The question that arises is whether you can ever get these sorts of patterns without an eruption following?" "We had repetitive sequences of volcanic explosions in the Caribbean island of Montserrat in 1997 and 2003 which were preceded by similar tremors, with hybrid earthquakes that were periodic and then recurrence intervals decreased with time before the explosion. People are converging on a view on how magmas behave." While we obviously don't know exactly how volcanoes work, there's a hope that by recognizing patterns like this noise, we might be able to better prepare for our planet's periodic tendency to spray superheated gases and magma into the open air. If the ground screaming at you to leave the area isn't enough impetus to seek out safer climes, then you're a lost cause.